Our NAMI Support Group is open to family members, caregivers, or friends of persons dealing with a mental illness as well as those dealing with mental illness themselves. We meet the first, third, and (if there is one) fifth Tuesdays of each month, from 7:00pm to 9:00pm. As with everything NAMI does, the group is free; no reservation is required — just show up. Parking is available behind the church, off Evans Street, and you can enter either door on the back of the church. As the name indicates, we are a support group, there to support each other; we treat everyone with dignity and respect. Come and discover you are not alone. Alcoholics Anonymous (AA) is a mutual aid fellowship and support group with the stated purpose of enabling it members to “stay sober and help other alcoholics achieve sobriety.” St. Andrew’s hosts AA Meetings each Thursday at 6:00 p.m.
Narcotics Anonymous was established in response to the success of Alcoholics Anonymous. NA provides support for those attempting to recover from drugs other than just alcohol. The only requirement to become a member of NA is a desire to overcome your addiction. NA groups don’t make a distinction between any type of drug, including alcohol. They also recognize that polysubstance dependence is common. Any addict who wants to recover is welcome. 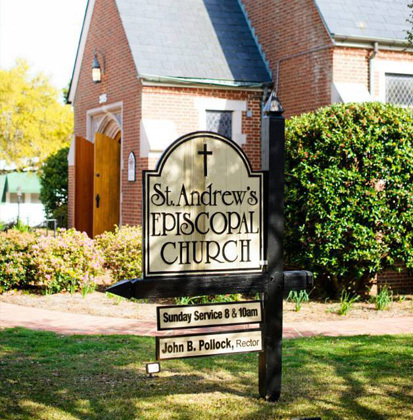 St. Andrew’s hosts NA Meetings each Friday and Saturday at 8:00 p.m.